There are about 16 main types of paediatric cancers (leukaemia, brain and spinal cord tumours, neuroblastoma, lymphoma, rhabdomyosarcoma, osteosarcoma…). Each of those is divided into several sub-groups. In total, it adds up to about 60 different paediatric malignancies. Each of them requires a specific scientific attention. Nowadays, anti-cancer treatments are heavy and leave survivors with severe long-term sequelae. Survivors will represent about half a million people in Europe by 2020. We must make sure that those long-term sequelae are either prevented or properly identified and treated. All paediatric cancers are rare but some are very rare and receive very little scientific attention even if some of them have a very poor cure rate (below 50%). The situation will only improve if we finance more research about those high-risk cancers. 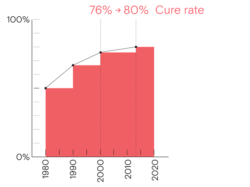 Kids cancer cure rate stalled over the last fifteen years. Interestingly, this is when most significant progresses occurred in adult oncology. Indeed, from 2011 to 2015, 70 new anti-cancer drugs were approved for adult malignancies. Over the same lapse of time, only 2 anti-cancer drugs were approved for paediatric malignancies. We must overturn these numbers! We want to make sure all children with cancer are cured, and better cured. By supporting scientific research, removing obstacles and connecting people. KickCancer finances clinical trials so that innovative drugs developed for adults are tested in children in a safe and ethical environment. KickCancer finances fundamental research in order to improve our understanding of the origin and functioning of paediatric cancers, which will allow, in the long run, the development of new drugs specifically targeting paediatric cancers. Because –fortunately- each paediatric cancer is a very rare disease, KickCancer will mostly support research at the European level. The scientific soundness of each project supported by KickCancer is validated by an external scientific body. Many institutions already finance research projects in oncology (research centres, foundations, associations); yet paediatric cancer projects are often overlooked because every paediatric cancer is a rare disease. KickCancer intervenes with those players so that paediatric cancers are included on their priority list and benefit from increased financing. KickCancer promotes innovation on paediatric cancer not only by financing research but also by making sure that the other players do not forget about kids cancer and by inducing them to invest as well. At the European level, KickCancer is an active member of the group Unite2Cure which assembles individuals and associations from several European countries and advocates for changes in the European legislations that will foster better treatments for children with cancer. Specifically, Unite2Cure collaborates with SIOPe to demand a modification of the European Regulation on Paediatric Medicines, to the effect that innovative anti-cancer therapies developed for adults benefit to the children as early as possible in the development process. KickCancer also participates in the Accelerate platform, an open forum for all the players in the field of paediatric cancers (pharmaceutical companies, academic paediatric oncologists and haematologists, parents organisations, and regulators) with the joint purpose of speeding up the access to innovative drugs. At the Belgian level, KickCancer is advocating amending certain regulations, with the support of the Belgian Society of Paediatric Haematology and Oncology (BSPHO), in order to simplify the handling of the treatment of children in Belgium, with for instance the automatic reimbursement of certain drugs or the administrative simplification of the reimbursement process of hospitalisation outside of Belgium.